In an effort to learn and understand what is going on with all the different trends in running over the last few years, I have purchased a lot of books. Lots of them have been a waste of money. Chi Marathon, by Danny Dreyer was certainly one of them. I already have a copy of his previous book, Chi Running. The combination of the two books certainly gave me an insight into Chi Running, but also convinced me to be more trusting of the one star reviews at Amazon.com. They are more likely to be on the mark, especially if the faithful start attacking the one star reviews (see the 1-star reviews). I should have been prepared for the book, as any book that promises what I usually call ‘the second coming of the messiah‘, ie the promise of an injury or pain free running in the absence of evidence should be a red flag. If you are going to make claims like that, then it should be expected that you have the evidence to back it. I already knew that they had none. When the book arrived a few months back, I eagerly opened the box. The cover should have been another red flag: “Natural Running Program“. They fell for the natural fallacy. That is just a marketing ploy. Like you normally do when you first pick up any new book, you generally open up a random page to have a look. The first random page I looked at was discussing the Lieberman et al article that appeared in Nature. The author stated that Lieberman et al compared a group of barefoot Kenyan runners to shoe wearing runners at Harvard University. Wrong. That is not what they did. In reality, if you read the paper, they actually eliminated the Kenyan runners from the analysis! This book is off to a really bad start with that red flag! The next random page I turned to was a comment about plantar fasciitis, that picked up my interest to see what he says. Essentially he said that plantar fasciitis was due to heel striking! Wrong. Why do we see plantar fasciitis in so many that forefoot & midfoot strikers and why are there so many runners on forums who forefoot & midfoot strike asking for advice about their plantar fasciitis if heel striking is the cause? (and looking at the research evidence, there is none that this is a factor in plantar fasciitis; in fact the opposite may be the case). The bad start with this book is still going with yet another red flag! I had to put the book down after that. How can an author get some of this so wrong? It does not auger well for believing what you read in the rest of the book. It took me a while to pick it up after that. When I finally did, I had to concur that those 1-star reviews on Amazon.com are on the mark about Chi Running. As I said in a previous rant on Chi Running, I have nothing against Chi Running. Its just the factual errors in the book; the inability to properly understand and appraise the research; the promise of the ‘second coming of the messiah‘; the belief in the ‘one size fits all‘ when it comes to the best way to run; and of course, the misuse, misrepresentation, misquoting and misinterpretation of the science. Books like this read like a manifesto from a political party. The party faithful love them. Chi Runners will love this book. The rest of us will wonder why they are so gullible to fall for it. …then, of course, you can buy the DVD, and then buy the course, and then buy the… you get the picture? 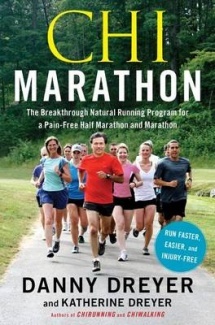 I have to agree that the ChiMarathon book doesn’t add anything new about the topic. I see it more like a commercial for all the other ChiRunning stuff you mentioned. But I also have to say that the technique they teach is correct, if you learn and perform it properly. Just focus on relaxation, postural alignment and leaning and you’ll actually notice the difference in the economy and quality of your running. I’ve tested it in several races and can confirm it does work. It’s true they’re now trying to sell a product and attract people with a manifesto from a political party, but my advice is go to the core of it, and just take what’s useful for you. For me, ok, for me, this technique taught as shown in the first book does work… call it ChiRunning, Pose, Kenyan style or whatever…. How can it be correct when the evidence shows its a less economical way to run?